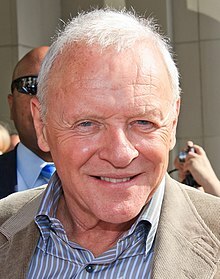 Sir Philip Anthony Hopkins, CBE (born 31 December 1937), is a Welsh film, stage, an televeesion actor. Efter graduatin frae the Royal Welsh College of Music & Drama in 1957, he trained at the Royal Academy of Dramatic Art in Lunnon, an wis then spottit bi Laurence Olivier that invitit him tae jyne the Ryal Naitional Theatre. In 1968, he got his stairt in film in The Lion in Winter, playin Richard the Lionhert. In the mid 1970s, Richard Attenborough, that wad direct five Hopkins films, cried him "the greatest actor o his generation." Conseedert tae be ane o the greatest leevin actors, Hopkins is weel kent for his portrayal o Hannibal Lecter in The Silence of the Lambs, for that he wan the Academy Awaird for Best Actor, its sequel Hannibal, an the prequel Red Dragon. Ither notable films include The Mask of Zorro, The Bounty, Meet Joe Black, The Elephant Man, Magic, 84 Charing Cross Road, Bram Stoker's Dracula, Legends of the Fall, Thor an its sequels, The Remains of the Day, Amistad, Nixon, The World's Fastest Indian, Instinct an Fracture. In 2015 he starned in the BBC televeesion film The Dresser, an syne 2016, he haes starned in the creetically acclaimed HBO televeesion series Westworld. Alang wi his Academy Awaird, Hopkins haes wan three BAFTA Awairds, twa Emmys, an the Cecil B. DeMille Awaird. In 1993, he wis knichtit bi Queen Elizabeth II for services tae the airts. He received a starn on the Hollywood Walk of Fame in 2003, an wis made a Fellae o the Breetish Academy o Film an Televeesion Airts in 2008. ↑ Crace, John (23 January 2012). "Anthony Hopkins: 'I've never really been close to anyone'". The Guardian. Retrieved 23 January 2015. I don't know where everyone gets the idea we were good friends. I suppose it's because we are both Welsh . ↑ "Hopkins 'greatest British actor'". BBC News Online. London. 16 August 2005. Archived frae the oreeginal on 15 January 2009. Retrieved 29 October 2008. ↑ "Anthony Hopkins Biography". Tiscali.co.uk. 29 October 2008. Archived frae the oreeginal on 22 December 2008. Retrieved 29 October 2008. ↑ "Anthony Hopkins". The Guardian. Retrieved 29 October 2008. ↑ Sir Anthony Hopkins portrait The Daily Telegraph. Retrieved 6 Januar 2011. This page wis last eeditit on 4 Februar 2018, at 19:59.